Will Ramadan affect my holiday on Gili Trawangan? Gili Trawangan is a paradise for holiday makers and is mostly Muslim. Ramadan is a holy month where many Muslims fast during the day and dedicate more time to their religion. It is a key part of the Muslim faith – but will it affect your trip? Ramadan is the most important month of the year in the Muslim faith. It marks Allah giving the first chapters of the Qu’ran (the Muslim holy book) to Mohammed. It is a time where many Muslims fast from sunrise to sunset, abstain from certain pleasures and pray often to become closer to God. It’s an important time for families to come together and celebrate. It is one of the 5 pillars of Islam: Sawm – to fast during Ramadan. It is a powerful symbol of unity within the Muslim Faith, as Muslims the world over experience their faith together. Confusingly, the date seems to change every year but is actually on the same day each year – on the Islamic calendar, which is a lunar calendar. It is held during the ninth month of the calendar, which means that sometimes there are two in one year. On the more common Gregorian calendar, which is solar, the dates change year-to-year. It also varies from country to country, depending on whether the new moon has been sighted or not. Most countries observe astronomy to calculate a more accurate start date for Ramadan. In many traditional countries, Ramadan does not begin until religious leaders have glimpsed the new moon. During Ramadan, observant Muslims refrain from specific activities during daylight hours. This includes eating or drinking anything (including water! ), smoking, engaging in sexual activities, gossiping, lying, and fighting. Though this is a physical challenge, it is seen as recognition that a person is not only a body, but a soul as well. Only healthy adults observe fasting, with exemptions for pregnant, menstruating and lactating women, the frail and ill, or travellers. It is said that those unable to fast should ensure they give one meal to the poor for each day they are unable to fast. During Ramadan, Muslims wake and eat a small meal a while before dawn. They will not eat or drink again until after sunset, when they will break their fast with dates and water (traditionally) followed by a big meal. It is also a time where Muslims reflect, donate to charity and spend time devoting themselves more fully to their faith. The attitude during Ramadan, despite the hunger, is often joyful. 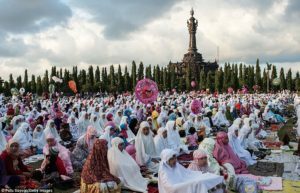 Why is Ramadan important in Indonesia? Indonesia is a huge country and it has many religions as a result. Over 87.2% of the country identifies as Muslim. Other religions include Hinduism, Buddhism, Protestantism, Catholicism and Confucianism. However, this can change depending on the island you’re on. Bali, for example, is 83% Hindu. Despite being so close to Bali, Gili Trawangan is mostly Muslim. Many of the locals come from nearby Lombok which is also Muslim. There are also many people whose ancestors originated from Sulawesi – another mostly Muslim island. Though saying this, there are also some people practicing Hinduism on Gili Trawangan – often immigrants from Bali. Because of the high Muslim population, Ramadan and Eid-al-Fitr are a big deal. How will Ramadan affect me and my holiday? One thing to bear in mind is that many people are travelling to visit their families. So travel, especially around Eid, might get a little hectic. It might be a good idea to allow a little extra time to get anywhere. If you are arriving in Lombok or Bali to head to the Gili islands, try and book a private pick-up ahead of time. Particularly in Lombok, it would be like trying to get a taxi on Christmas Day. (Except with Indonesian traffic thrown in, just for fun). Expect more traffic than normal and raised fares for taxis. The apps GoJek or Grab can be useful for finding taxis on Bali. The app “The Gilis – Boats and Weather” can also be used to check the boat schedule between the Gilis and Bangsal. To check the schedule from Bali, it’s best to check with your specific boat company. Not sure how to come and find us? Check out our tips here. There are several mosques on Gili Trawangan, with the biggest located just behind the main street. There are several calls to prayer daily which last for a few minutes or up to an hour depending on the day and time of day. These occur every day of the year on Gili Trawangan, but will increase in length and frequency throughout Ramadan and Eid. They are fairly loud and if you are staying somewhere nearby the mosque, they can be a little intrusive. This is just a fact of life on Gili Trawangan as most places to stay are nearby the main street. A good recommendation is to bring earplugs with you if you’re a light sleeper! To find out more about our dive and stay packages here. Dressing respectfully on Gili Trawangan should always be a priority. Obviously, bikinis are completely fine on the beach. Shorts and t-shirts are fine for walking around the streets too. However, it’s a good idea to keep daisy dukes and crop tops to a minimum if you’re not on the beach. This is all true year-round on Gili Trawangan, and the other Gilis, but it is especially true during Ramadan. Another consideration is how you treat the Muslim people you interact with. Though they may be at work as normal, they may not have eaten or drunk anything in a while. Please spare a thought for how difficult it can be to be hungry and thirsty – especially in a tropical paradise. Refraining from eating in front of those fasting might be considered polite but it isn’t really expected. There may also be more staff spending time with their families, so places might be more short staffed. Patience is always a virtue in Indonesia, but during Ramadan, that applies more than ever. That extra smile or “Terima kasih” (thank you!) goes a long way! Can I celebrate Ramadan respectfully too? Yes! The atmosphere during Ramadan is often peaceful and happy. Many Muslims try to focus their worries on being their best selves, rather than everyday personal concerns. Also, after Iftar (the second meal of the day), the street food stalls are busy and everyone is happy and lively – food will do that! If you’re feeling generous and have made friends who are Muslim during your stay, it is sometimes a nice touch to give a small present during Eid. For example, a small gift of dates is traditional. Ramadan shouldn’t interfere with your paradise on Gili Trawangan too much. Generally speaking, things will be open as normal except around Eid where opening hours might be shortened. 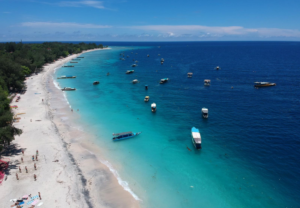 Travel to the Gilis might be disrupted or busier than normal around Eid as well. But due to the lack of motorised transport, travel around the island should be fine. Ramadan on Gili Trawangan is a happy, festive time and generally is a really nice time to be on the island! Gili Divers will be open as normal through all the above dates. Drop us an email to come and dive with us during Ramadan, or any other time! Check out our discover scuba diving courses here.